The art of creating unique and impactful TR customer experiences. Over the last few months, the TR channel has seen an increasing number of brands invest in pop-up stores and in-store initiatives in a bid to ‘wow’ travellers with unique customer experiences at airports worldwide. Many brands are investing this way to engage with both new and existing customers, particularly during the ‘golden hour’ – that critical time that passengers spend between exiting security and boarding their flight. Cosmetics and beauty brands, in particular, are focusing on providing this experiential aspect in highly curated spaces – often in the form of pop-up stores – in order to enhance their global brand awareness and, of course, drive sales. L’Oreal, for example, recently showcased five of its iconic brands – Giorgio Armani, Lancome, Yves Saint Laurent, Ralph Lauren and Maison Margiela – on a multi-luxury brand podium at Doha International Airport, to highlight its strong, diversified portfolio and offer a unique customer experience. The ‘eye-catching’ podium created ‘excitement, buzz and retailtainment’ by inviting passengers to step into the podium as if entering a luxury hotel and enjoy an exclusive fragrance voyage of discovery through five different scented worlds. In fact, most of L’Oreal’s brands invest in individual promotions at airports worldwide through the pop-up concept. For example, since its successful debut in 2017, the Armani Box Pop-Up Store has been travelling through various countries, allowing travellers the opportunity to discover Giorgio Armani makeup. Its red walls and black lighting fixtures, in line with the Italian brand’s DNA, welcomes guests, together with a giant gorilla named Uri – a replica of the full-sized gorilla statue that resides in Mr Armani’s Milan home. Customers get to try out the brand’s latest makeup products, take a photo or selfie with Uri for a memorable souvenir of their experience as well as take advantage of expert makeup advice and services on offer. The Armani pop-up recently landed at Roissy Charles de Gaulle Airport after a successful stint at Hong Kong. According to Julie Audouin-Urdangaray, L’Oreal Luxe Travel Retail Deputy Manager, pop-up stores attract travellers in a very efficient way and help them discover new brands/products in a dedicated space outside the duty free shops. ”With a strong and clear concept, including surprise, impactful retailtainment and animation, pop-up stores provide an unforgettable customer experience. They arouse awareness, build image and drive penetration”, she confirms. But L’Oreal isn’t the only company to invest in creating unique customer experiences. Shiseido Travel Retail and Coty have also recently created pop-ups to raise ‘brand awareness’ and wow their customers. 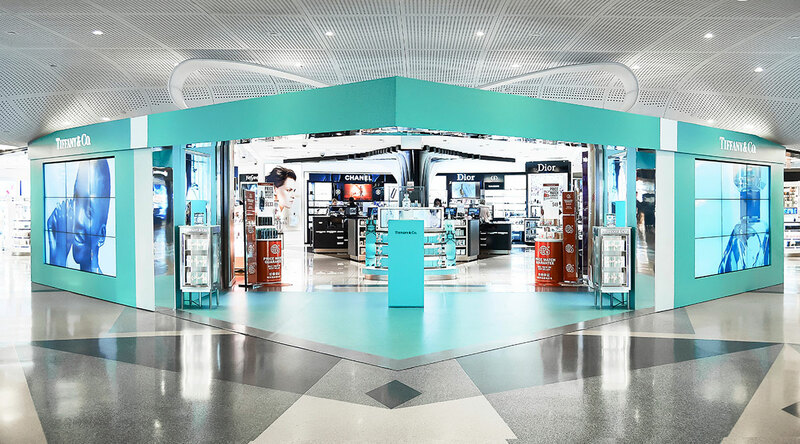 Coty, for example, commissioned a ‘one-of-a-kind’ pop-up for Tiffany, which resembled Tiffany’s ‘highly coveted’ and ‘well recognised’ signature blue gift box at JFK’s T4 earlier this year. Both home and cosmetics brands Molton Brown and Rituals have also been focusing on providing customers with meaningful duty free and travel retail experiences in order to build brand awareness. Rituals, which has four standalone stores in Amsterdam Schiphol as well as stores in Arlanda, Vienna, Eindhoven, Zurich, Luton and Munich airports, recently ran a podium promoting the Rituals limited edition range, Anahata, in Oslo. Neil Ebbutt, Director Global Travel Retail at Rituals Cosmetics, believes that the extra space provides the opportunity to not only offer passengers a wider range of products, but it also helps the company bring its core message to life by creating opportunities for experiential engagement with customers. 15 minute spa services and water basins are good examples that allow customers to try before they buy. Providing these added services clearly appears to be paying off. Last year, Rituals’ travel retail business grew by over 52%, with airport standalone stores contributing significantly to that performance. Mark Johnson, President of Molton Brown Global, also confirms that growing its experiential offering, together with a refocus on the brand’s exclusive qualities, has helped to turn the company’s fortunes around. ”Our hand and arm massage – a popular concept from our standalone stores – has recently been introduced to travel retail to offer passengers a more meaningful and relaxing travel experience” he said. ”It’s the perfect opportunity to immerse consumers into our story and make them aware of the craftsmanship and authenticity behind our brand, while they enjoy a massage”. In summary, providing impactful, unforgettable and unique consumer experiences – whether in-store or as a pop-up store – is now increasingly becoming a priority for many brands in travel retail. Exactly how much they are prepared to invest to ‘wow’ their customers, of course, depends on how much value they place in the channel. But, given the increasing number of pop-ups popping up at airports, it appears that the investment is worth it.